Olive ridleys, named for their greenish skin and shell, descend on a number of Mexican states along the Pacific coast between May and September to lay eggs. 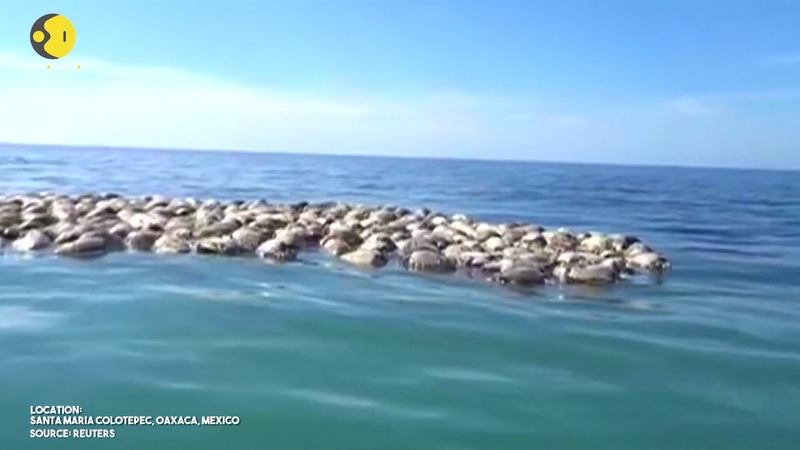 Mexico's office of the federal attorney for environmental protection (PROFEPA) said the turtles were found in a 393-foot long net that is not approved for fishing, according to the Associated Press. They were dead for about eight days and badly decomposed when they were found in the water near Puerto Escondido, Oaxaca, PROFEPA said. Earlier this year, World Animal Protection released a report highlighting that 640,000 metric tons of fishing nets are lost or discarded in our oceans each year, trapping and killing countless marine mammals, including endangered whales, seals and turtles. Shallow coral reef habitats also suffer further degradation from the gear, which can take up to 600 years to decompose. The grisly discovery comes just days after 113 endangered turtles were found dead in the southern state of Chiapas. The turtles were found dead between July 24 and Aug. 13 in different parts of the Puerto Arista sanctuary. The cause is still being investigated, but experts said the animals could have died from asphyxiation, fish hooks or harmful algae, PROFEPA told Reuters. In the U.S., olive ridleys are listed as "threatened" under the U.S. Endangered Species Act, but they are likely to become endangered or in danger of extinction within the foreseeable future, according to the Sea Turtle Conservancy. They are listed as "vulnerable" by the International Union for Conservation of Nature.